Corpus Christi artist, Joe Peña, shares a set of personal experiences with us — he takes us with him on an intimate tour of Texas food trucks. 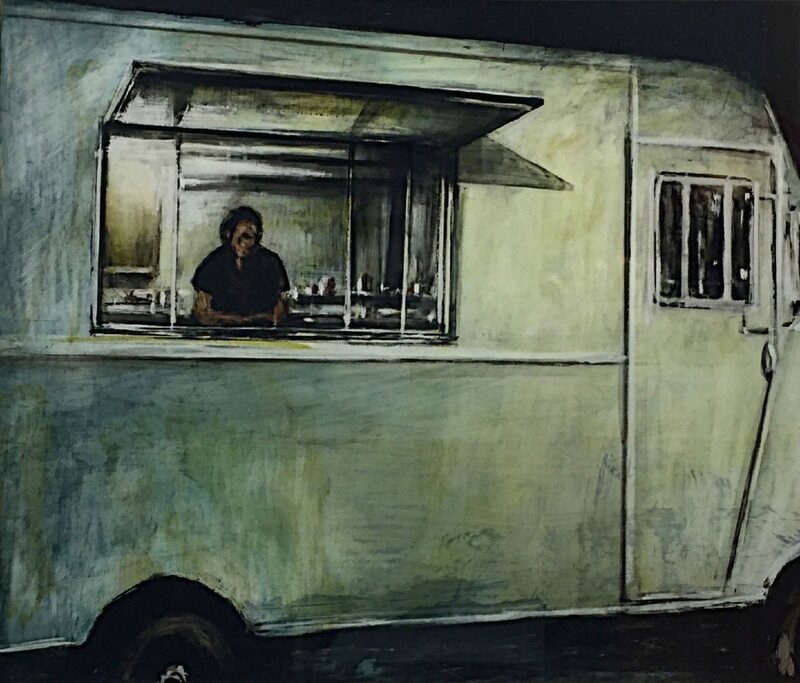 “Food Trucks at Night,” is on exhibit at the South Texas College Library Gallery. The series began with Peña’s late-night visit to pick up a couple of tacos from an oft visited truck, and quickly turned to documenting his visits to numerous other food trucks/stands, observing the atmosphere both in and outside the structures. 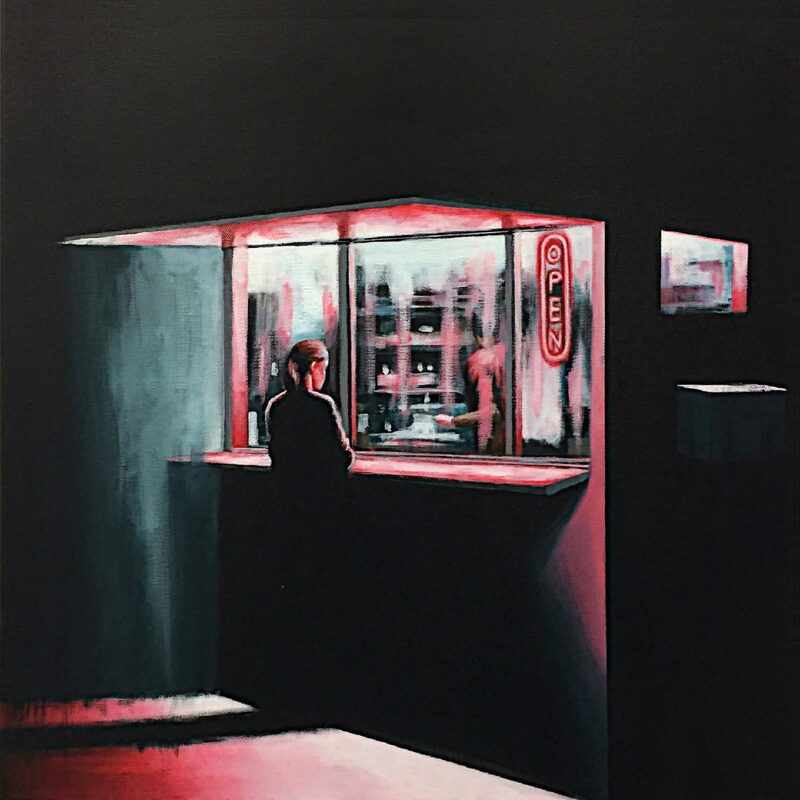 Peña establishes an intimate mood by the modest size of his oil, acrylic, and ink paintings, and by the dark backgrounds that he uses to dramatize his subjects and give them importance. 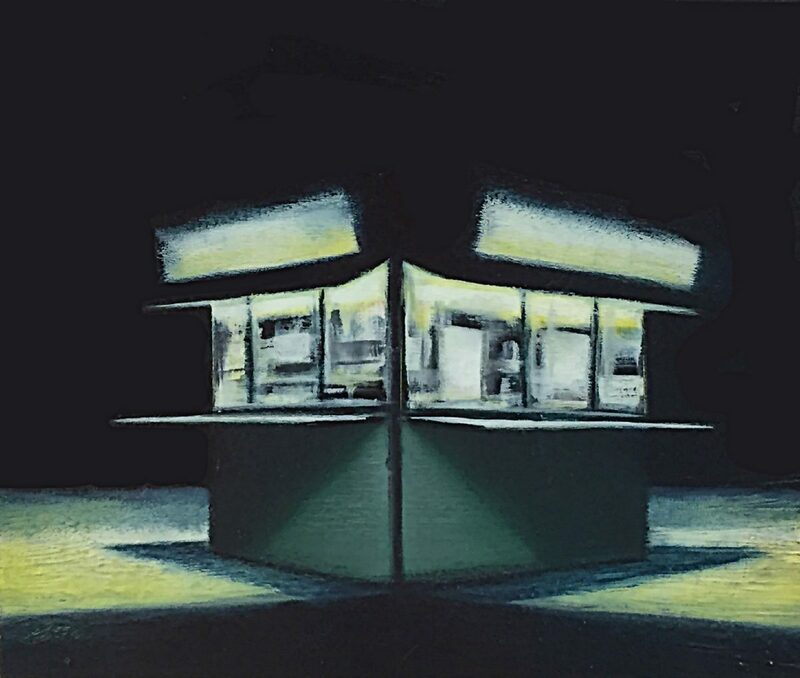 With the quietude of Edward Hopper’s urban scene paintings, Peña’s paintings endorse a realistic style. 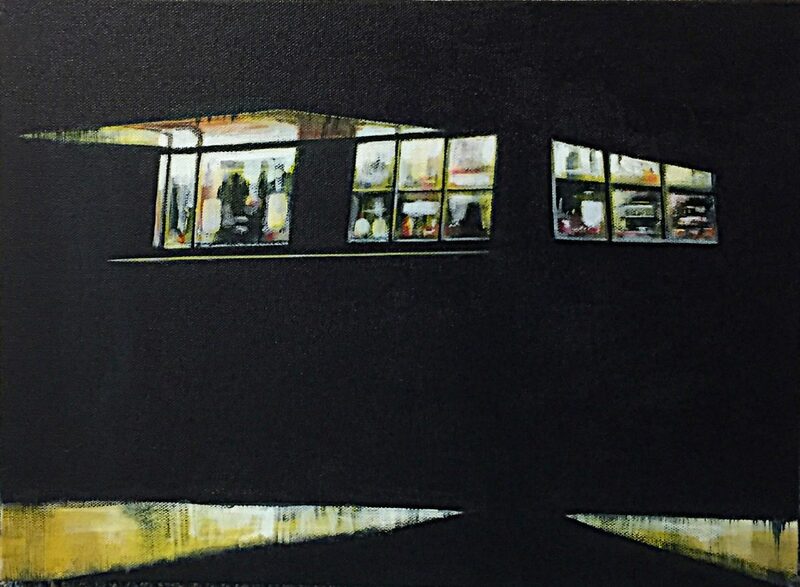 However, the ambiance of isolation in the food truck paintings is often achieved by surrounding his subjects with an opaque black night. Rather than ominous, the black background pops the life of these trucks/stands into our consciousness. While the food trucks are rendered with realistic detail, figures and interior views sometimes show a more casual brush technique. The artist counter plays these elements to create unique and haunting images. The small compositions demand a one-on-one relationship with the viewer, evoking a voyeuristic feeling. 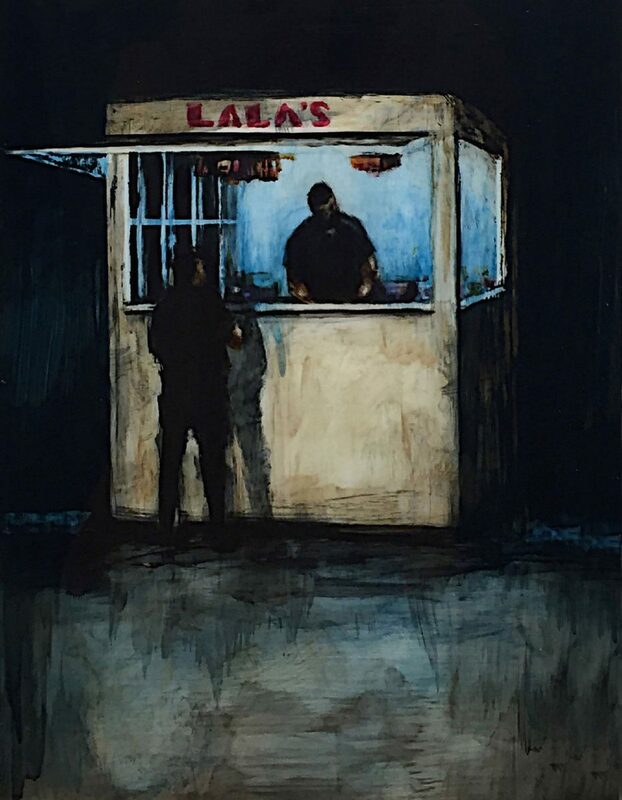 Peña’s general work typically explores issues of ethnic identity relating to his Mexican heritage, but the popularity of the food stand and taco truck have spilled over across cultural identities to become a staple of the American landscape, regardless of the food being served. American food trucks first appeared as conveniences for special populations. For instance, the Texas chuck wagon became a thing in the late 1880s, lunch wagons began about the same time in Rhode Island for pressmen and journalists, and the 1940s saw mobile canteens operated on stateside army bases. In recent years, a food truck resurgence has been fueled by a combination of post-recessionary economic factors. Food truck parks are found in urban and suburban areas across America, including McAllen’s own food truck court adjacent to Archer Park. With Peña’s food trucks, the culture of South Texas is not only documented, but he has stepped over into a world-wide phenomenon. 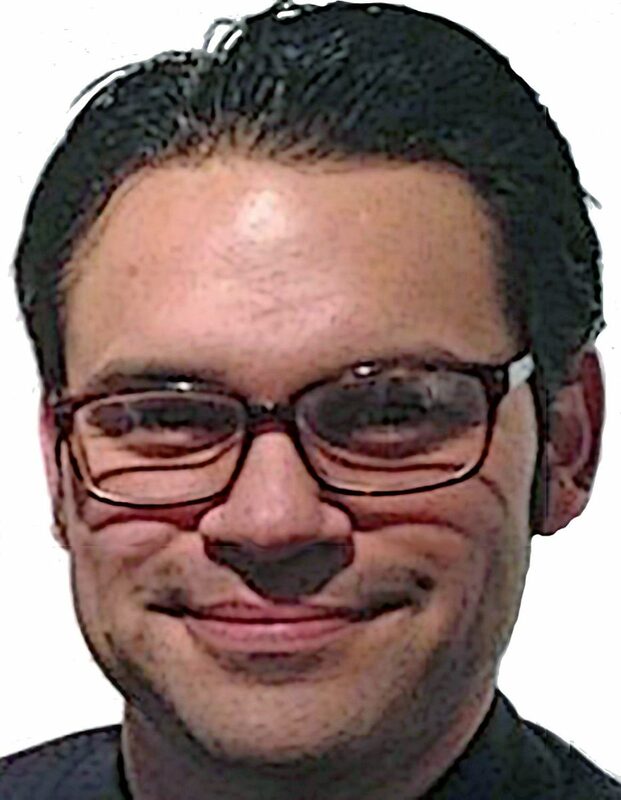 Peña’s trucks appear isolated and few, but they are not. Along with portable food booths and food carts, they are on the front line of the street food industry that serves an estimated 2.5 billion people world-wide every day. “Each truck/stand has its own presence and the visitors become its culture,” Peña said.